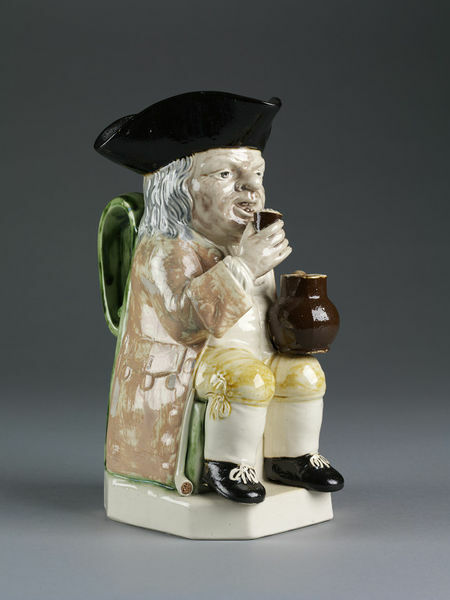 The ‘Toby jug’ – a beer jug shaped as a seated drinker with three-cornered hat, frock coat, clay pipe and mug overflowing with frothing beer – is one of England’s most distinctive ceramic designs. The subject was inspired by an engraving accompanying a song featuring Toby Fillpot published in 1761. Toby Fillpot (ie ‘fill pot’) is described as ‘a thirsty old soul’ and is apparently based on a man said to have drunk 2,000 gallons of ale. 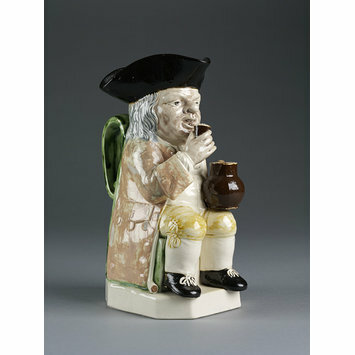 Although Toby Jugs are modelled as unsophisticated rustic drinkers, some at least were sold through smart London china shops, indicating that they also appealed to a sophisticated metropolitan market.They are first documented in pottery in 1783, when they were being sold by the Wood family of Staffordshire potters, and were still popular in the 1820s, by which date several variant designs had been introduced. This one was decorated with pigments before it was glazed and is an early example. Later ones are often painted with a distinctive range of high-temperature colours, and late pieces are usually painted in enamels. Creamware, of which this piece is made, is a type of cream-coloured, lead-glazed earthenware. It was made from white-firing clay and calcined flint, and was developed in Staffordshire during the mid-eighteenth century. Famously, the great industrialist and potter Josiah Wedgwood supplied his perfected creamware to Queen Charlotte and then marketed his products as ‘Queen’s Ware.’ Creamware was a tough, inexpensive and hygienic material, which could be decorated with coloured glazes, transfer-printing, enamel painting with or without gilding, or left plain. It was hugely popular with both middle-classes and the wealthy for tea-wares, dinner services and a great variety of functional objects. Going out of fashion around 1820 in England, it remained popular for much longer in continental Europe. Probably made at the factory of Ralph Wood.